All four coins in this superb set feature a reverse image by Canadian artist Lilyane Coulombe showing a maple leaf’s movement as it drifts in the air across each coin. The 1 oz coin is edge lettered with a different serialized number. Contains 1.4 oz of .9999 fine gold. 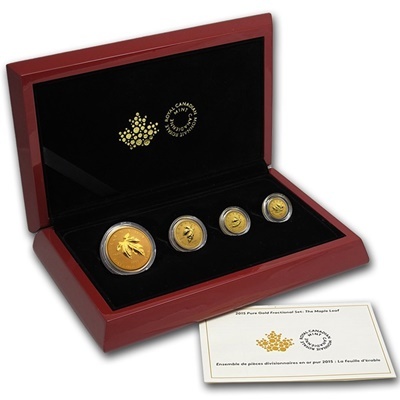 Each Fractional Maple Leaf Set comes in the following sizes: 1 oz, 1/4 oz, 1/10 oz and 1/20 oz. Comes in a custom maple-wood collector box with a certificate of authenticity. Obverse: Right-facing profile of Her Majesty Queen Elizabeth II, along with the year and face value. 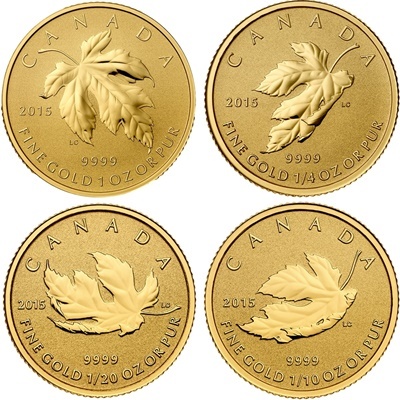 Reverse: Each coin features a different image of a maple leaf as it spins gracefully in the air. 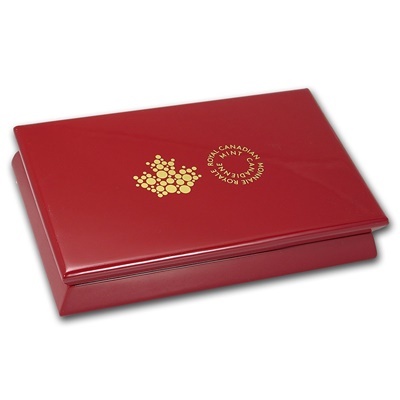 Guaranteed by the Royal Canadian Mint with a mintage of only 600 sets. First Reverse Proof incuse fractional set from the Royal Canadian Mint.